Here’s some pics of both of my new Clapton’s. Nice pair. Reminds the original prototypes Eric used in the mid 1980s for his August disc. Me too Chromeface, been watching this awesome disc, “EC Live At Montreux”. Is that DVD which inspired you to buy those babies? One of the two pewter prototypes became black during the 2nd half of 1990. The torino red prototype was given to Sir Ian "Beefy" Botham as a gift in an exchange of his bat. They all featured 22-fret necks handcrafted by Michael Stevens. Lol, yes the DVD did inspire me. Strange as I'm not a huge Clapton fan but my favourite guitarist Andy Latimer of the prog band Camel used one for many years. One should neve, ever, get rid of an EC Strat! It’s just a great guitar all around. You can get sooo many tones out of it - so versatile. Don’t have to be an EC fan to enjoy it. True, and having to sell mine was a very difficult and sad decision but sometimes needs must. I'm really enjoying the Roadhouse Strat I bought recently and am currently populating a new scratch plate with the Clapton mid-boost and Lace Sensor gold pickups to drop in to this guitar. It will be a Clapton Strat of sorts I guess but with not quite the same charisma or resale value. I think it will be great until I can get back on my financial feet and start looking around for the real mc-coy again. Sounds like a plan Pete, let us know how it turns out. I own the father of that guitar. Chromeface will explain. Maybe he can dope out those photos I posted a couple of years back. Can't do that on my tablet. Love to hear about it, and see those pics ZZ. Scroll up to the masthead. Go into Members. Search ZZDoc. Tap on my name. In the search box for posts enter the words: clapton prototype. When the page comes up, scroll down to the photo. There's also quite a bit of conversation you can peruse. We Clapton players have been talking about this guitar for years. I got lucky on eBay one day. My tech and I searched Vintage Guitar. It appears that 12 of these were built by the nascent Custom Shop for the '88 Winter NAMM introduction of the model. The Shop's first logo is on the back of the headstock and the neck pocket. Absent the mode switch, which Eric didn't want, it's the same specs as the red and pewter prototypes they gave him to tour with in '86, one of which is on the jacket of the DVD, which I also own. 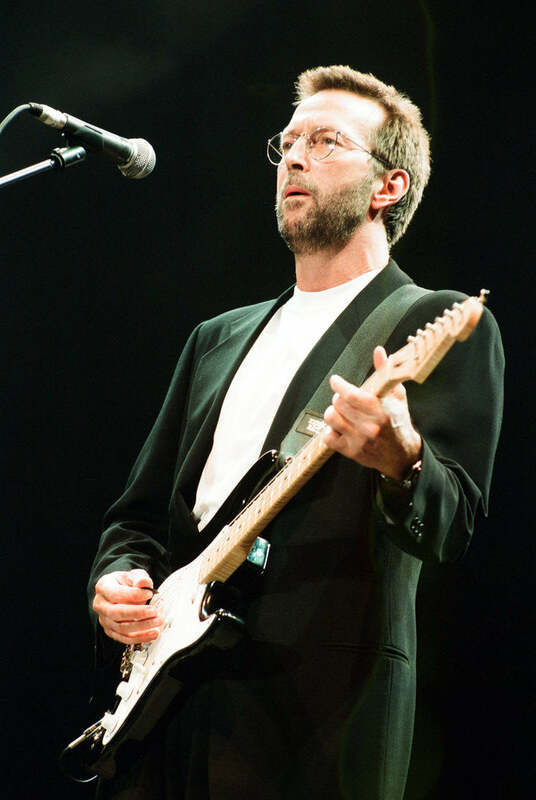 BTW..Chromeface has been our Clapton guru in facts and photos for years so I generally defer to him. The Strat Plus guy is Xhefri, hands down. He's a great friend, a good man, and has a website to die for. Great player. The neck's a tad less tapered than my '89. One of the pewter prototypes, #V00009, became black during the 2nd half of 1990, its last public appearance dates from 1993 after Eric gave up smoking. Offered for sale by the San Francisco Art Exchange Gallery in 2017, it fetched £247,000. Sir Ian "Beefy" Botham actually owns #V00007 which received from Eric as a gift after trading it for his bat. The guitars in their present state sport highly figured maple necks with 22 vintage frets. Last edited by chromeface on Sun Nov 25, 2018 6:31 am, edited 1 time in total. One of the pewter prototypes, #V0008, became black during the 2nd half of 1990, its last public appearance dates from 1993 after Eric gave up smoking. Offered for sale by the San Francisco Art Exchange in 2017, it fetched £247,000. There ya go!! 'Johnny on the spot!!!" Sir Ian "Beefy" Botham actually owns #V0007 which received from Eric as a gift after trading it for his bat.